The sensational PS2 game, "God of War" arrives on PSP entitled "God of War: Chains of Olympus" which delivers almost identical gameplay and graphics on this powerful handheld console. Once again, gamers are transformed into the anti-hero Kratos and after he was deceived into killing his wife and daughter, he has denounced his service to Ares, the God of War. In order to seek absolution from his past, Kratos must battle a plethora of ancient Greek enemies, until he arrives at his intended destination in this classic arcade adventure that will have funs raving for more! Mythological Odyssey: This story is set in a time before the events of God of War, where players will experience Kratos' journey during the 10 yrs of servitude to the Gods of Olympus. The gameplay of God of War: Chains of Olympus features your blockbuster style of arcade game with highly polished graphics and gameplay as you slice, fight and climb your way through a fully 3D interactive gaming world. 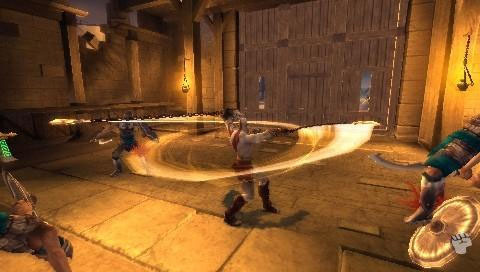 As Kratos, you must also solve a variety of simplistic puzzles in order to reach various destinations in the rich gaming world which goes hand in hand with the gameplay. Object can also be manipulated through mini-games where the player must successfully complete a sequence of button taps such as Circle, X and Square or you repeatedly tap the circle button to open a door. Moving around the world of God of War is simple amazing on the PSP and my only complaint is that the screen is sometimes a little too small as there is so much detail happening at once. The combat is what sets this game apart from its "competition", although there really is no game like it on the PlayStation Portable. 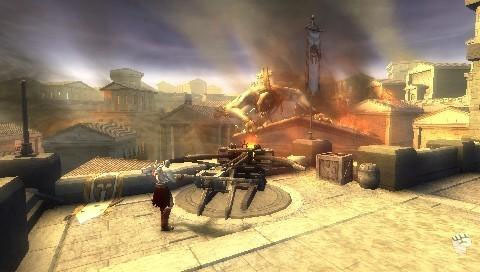 Kratos can perform a variety of maneuvers in the game, making for some interesting fight scenes as he whips his deadly chains around... think Devil May Cry, however set in ancient Greece. The AI of the title is quite decent and every now and then you will encounter a boss character where the player must defeat the enemy be pressing a sequence of buttons like Circle, X, X and Circle. This makes for some thrilling and engaging gameplay. 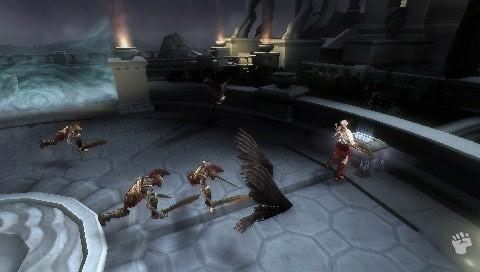 Graphically, God of War: Chains of Olympus is one of the most impressive titles on the PlayStation Portable with beautifully created gaming environments that are also sometimes interactive. Match that with realistic character models and a beautiful colour palette and this game is perfect. The musical score is a great and has a real majestic orchestral feel to it as are the sound effects. In conclusion, God of War: Chains of Olympus is brilliant which features a healthy dose of puzzles, combat and entertainment that is easily one of the best games on the PSP for quite some time. Great gameplay, perfect storytelling... it doesn't get better than this!